A term applied to Ranged Champions in the game League of Legends. Their main job is to farm and deal continuous, powerful attacks. Mostly used in role-playing games , a Buff is a temporary beneficial effect to a character. For example, a special power increases a characters damage affect for a certain period of time. An online first-person shooter game developed by Hidden Path and Valve Corporation. Major tournaments are held throughout the world for CS:GO with teams competing vs each other for hug cash prizes. It is also one of the most popular Fantasy Esports games on such sites as AlphaDraft.com. Used to describe multiplayer gaming competitions usually involving the highest level of players. The most popular games for these competitions involve either Multiplayer Online Battle Arena games such as LOL or DOTA2 and first person shooter games like Counter-Strike and Call of Duty. A term used by players to describe any continuous or monotonous task in order to get ahead in esports. For example, in LOL farming might refer to killing many minions in order to gain gold. To ambush an enemy. Most often used in Multiplayer Online Battle Arena games like DOTA2. A term applied to a Champion in the game League of Legends that fills a certain type of role. A Jungerls main role is to kill neutral monsters in the jungle in order to gain gold and experience. Junglers can be broken down into 3 different types – Ganking Junglers, Farming Junglers and Control Junglers. KDA ratio is an important stat that measures an esport players kills and assists to deaths. The formula is pretty simple, (Kills + Assists) / Deaths. It is thought that the higher your KDA the more you are contributing to your team’s success as opposed to helping your opponents. For example, if you had a KDA ratio of 4 you are essentially contributing 4 points per 1 death. A KDA ratio of 2 to 3 is generally considered average while anything above 4 is considered excellent. An annual Esports competition featuring the highest level of players for the League of Legends game. It is run by Riot Games and takes place in both North America and Europe. Twenty teams compete (10 per continent) all season long against each other culminating with a playoff series between the top six teams on each continent. The top 3 teams from each continent then qualify for the League of Legends World Championships. It is a similar setup to Major League Baseball where the National League and American League play all season long and then the top 2 teams from each league play in the World Series. A Multiplayer Online Battle Arena game developed by Riot games. It is one of the most popular MOBA games played by over 67 million people every month. LOL has developed into a hugely successful competitive esports game where players battle throughout the year for cash prizes in a grand finale. Also known as Real Time Strategy, is a type of gaming genre. The general point of MOBA games is to destroy an opponents home “base” usually guarded and at opposite corners of a map. There are two opposing teams each trying to destroy the others base. Players usually control a strong unit called a “hero” and get assistance from spawned computer generated units that travel along set paths towards the opposing teams base. As the game goes on, a hero has the ability to power up and gain experience from kills. A hero can also gain gold for every second they are away from their base and for killing opposing teams and hero’s. This gold can be used to buy items that can make the hero more powerful and stronger. In the gaming world a Nerf means a change to something in the game to make it less desirable or effective. The term originated in the game Ultimate Online when developers made a change to the game to make swords less powerful in a melee. Players complained it was like they were smacking each other with nerf bats. 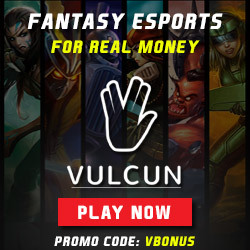 When playing Fantasy Esports on sites like Vulcun.com or Alphadraft.com you must designate one player as your “shotcaller” for the team. This player will then receive a 25% bonus to their point total. Think of a shotcaller like a team Captain in sports. The largest online streaming video platform used primarily for video games. It is the main broadcaster for live Esport gaming competitions and anyone who’s anyone in Esports has a Twitch channel. It was acquired by Amazon in 2014 for $970 million. A Fantasy Esports website that allows you to compete in a fantasy esports draft vs other competitors for real money. The goal is to draft a fantasy team of professional Esport gamers playing in live competitions who gain you points based on certain criteria. Who’s ever team gains the most points wins the top prize. You can draft teams for Esport Games League of Legends, DOTA2, Counterstrike, Call of Duty and Hearthstone.